Expansive soils are characterized by the presence of swelling clay minerals that are highly prone to moisture absorption, and can pose a significant hazard to support foundations for residential and commercial buildings and structures built over these types of soils. The most obvious way in which expansive soils and clays can damage foundations is by the uplift action they produce as they swell with increasing moisture absorption. The amount of moisture absorbed varies with the gradation of particles and the content of swelling clay minerals within the soil. Swelling soils can lift up and crack continuous strip footings and cause distress in floor slabs. Designing an effective method to stabilize these swelling soils are the key to helping prevent and/or minimize expansive clay foundation damage. To relieve the problem of swelling soils from affecting the integrity of foundation structures and to restrict foundation movement, the moisture content absorbed by the soil must be controlled. In order to stabilize the moisture content in expansive clay soils, and avoid expansive clay foundation damage to structures, a reliable method is needed that will effectively distribute, redirect and drain the moisture away from the structure. Moisture levels can vary within a large area of expansive soil, as well as fluctuate with the amount of seasonal precipitation and natural runoff. With suitable drainage, a stable moisture level can be maintained no matter how much vertical pressure or natural precipitation may occur. Structural geocells made from a novel polymeric alloy (NPA) material have proven superior to any geosynthetic for its flexibility, creep and high-tensile strength properties. While not completely impervious to water, sewage and other liquids, the cell walls are perforated so as not to impede the effective, natural drainage of the granular infill material. Stratum Logics geotechnical engineers seek a sustainable approach in developing solutions, and when geosynthetics present the best option, apply their knowledge and expertise of geosynthetics to solve the multiple issues encountered when attempting to build over expansive clays and other soft soils that are subject to fluctuating moisture absorption and swelling. 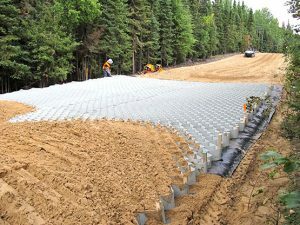 The incorporation of NPA geocells in our civil engineering designs has proven to be an excellent method of providing adequate, sustainable soil stabilization that will also assist in maintaining effective drainage for problematic, soft and swelling soils to minimize the risk of expansive clay foundation damage.